Common Names: Wild Lime, Satin Wood, Prickly Ash. Habit: Zanthoxylum fagara grows as a large shrub to small tree up to 10 meters in height. The branches typically have hooked spines below the leaves. The oddly pinnate leaves are arranged alternately with 5-9 leaflets with wings along the rachis. The leaflets are sessile, to 2 cm in length, ovate to elliptic with a crenate leaf margin and an emarginate leaf apex. The leaflets produce a citrus odor when crushed. The dioecious actinomorphic flowers are arranged in panicles of racemes. The calyx has 4 green unfused sepals. The corolla has 4 unfused yellowish petals. In staminate flowers there are 4 unfused stamens and a non-functional ovary. In carpellate flowers there are no stamens and a pair of unfused superior ovaries each with a single locule. The fruit is a capsule at maturity with a single shiny black seed. Habitat: Zanthoxylum fagara grows in Dry Broadleaf Evergreen Formation- Shrublands (coppice/scrublands) particularly those that have been disturbed by humans. 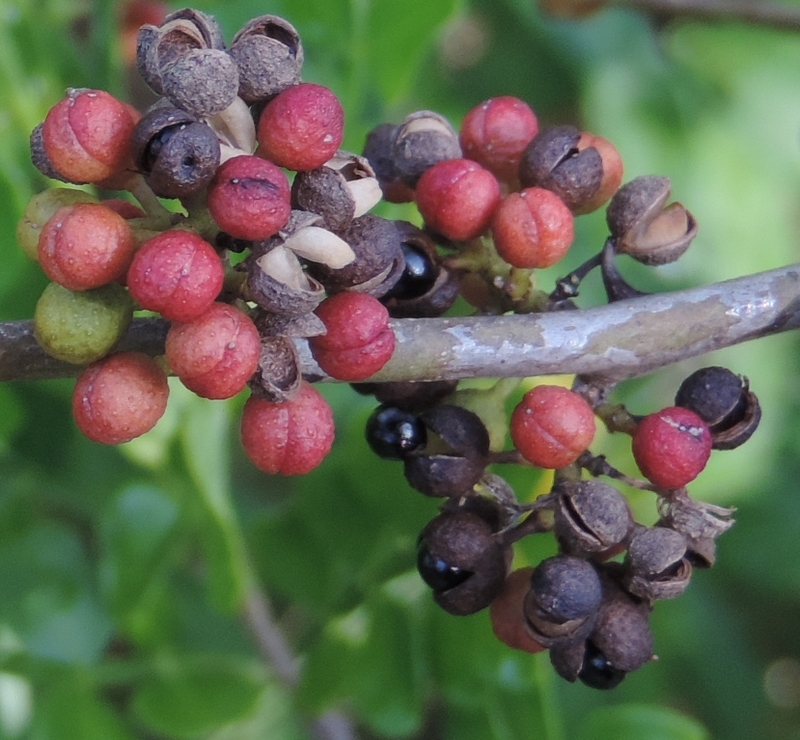 Medicinal/Cultural/Economic usage: Zanthoxylum fagara is used medicinally for general strengthening teas. Zanthoxylum fagara has also been used in the horticultural trade as well as a sought after wood for cabinetry.